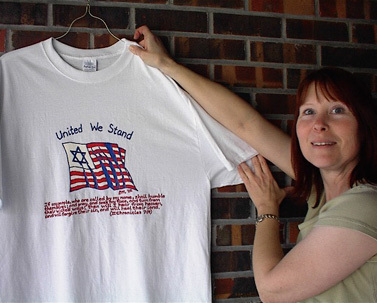 Debbie's WorshipWare is a store selling a selection of custom-designed, handpainted T-shirts, satin banners, handcrafted tabrets (glory rings) for dance and worship, and books of interest to Messianic believers, Jewish and Christian. I have also just begun to create handmade, unique genuine stone fashion jewelry, picture frames, and other unique gifts. The Lord has opened my eyes to the gift of creativity He has given me, and I pray that all my art glorifies Him. My original designs celebrate our Hebrew roots in the Torah, the foundation of our faith as believers in Yashua the Messiah, and people of His covenant. Each design is a way to share our love for the Holy Land of Israel and communicate our hope for the restoration and return of the 12 tribes to the Land. Many of us who study the prophets believe we are descendants of the House of Israel who were scattered among the nations and that we will be reunited with Judah, our brothers according to God's Holy Scriptures. Please browse through my store's departments from the links below. I hope you enjoy my designs and will come back to see new creations. I will soon be adding many pieces of handcrafted jewelry. As pieces are sold new and different ones will replace them. Please forgive my construction in the jewelry department, but you may enjoy looking soon. My Store has been visited times.